Click here for more information on KONA side event. KONA is presenting its new integrated service Your Data | Our Structures. We’ve partnered with leading renewable energy thought leaders and technology developers to deliver a significantly better renewable resource development service that we are unveiling at this Renewable UK event. If you are involved with financing onshore renewable energy infrastructure or managing energy yield assessment, please register your interest. Leosphere are world leaders in ground-based and nacelle-mounted LiDAR solutions for remote wind measurement and atmospheric observations. · WINDCUBE v2 is recognized as the best in class ground based LiDAR remote sensor with the most accurate data, proven by independent studies. · Avent Lidar Technology Wind Iris turbine mounted system has a proven track record of deployments by wind farm operators to yield a high return on investment with clear and easy to implement processes. 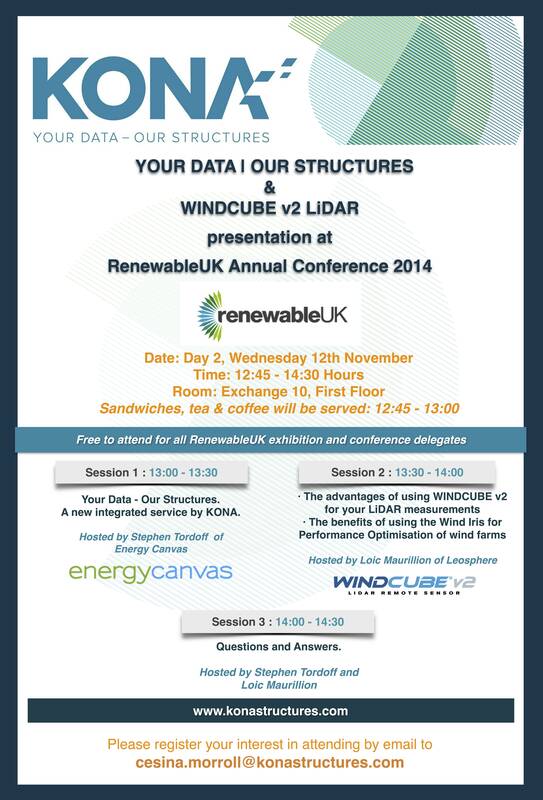 KONA are once again delighted to support sponsor the RenewableUK Annual Conference which is being held at Manchester Central from 11–13 November 2014. This 36th year of the event will see over 4,500 delegates, 200+ exhibitors and 150 speakers. KONA will be exhibiting at the IWEA Autumn Conference this year. The event will take place on Thursday 9th October 2014 in Lyrath Estate Hotel, Dublin Road, Kilkenny. Find out more about IWEA 2014 here. CE Marking certification for our SLX Mast Structures. +353 (0)1 801 5472 (Dunboyne Office).